Thinking about Pauillac the place and Pauillac the wine. It took me a while to learn to appreciate Pauillac first growth Ch. Lafite. Due to its weightless, even ethereal style, Ch. Lafite is difficult to evaluate young. As Lafite ages, it turns into that something so special that it can sit atop the Bordeaux pyramid with Latour, Margaux, Cheval Blanc, and Haut Brion. It took me a few years to see the path from point a to point b. Lafite is all about elegance and perfume, subtlety and integration. Nothing sticks out and everything fits. Lafite is not a blockbuster but it doesn’t lack power; it is just seamlessly integrated. The fruit is red and black and the perfume ranges across berries, tobacco, tea, berry liqueur, and gravelly-minerally earth. The second wine of Ch. Lafite is Carruades de Lafite. Leading first growth Ch. Latour is one of the three most consistently great properties in Bordeaux. I’ve never tasted a Latour I didn’t enjoy – and that includes some notorious vintages such as 1991. In great years, Ch. Latour is the blockbuster monster of the Medoc. In good years, it is still big and typical but director Frederic Engerer has the good sense and the finesse to scale it back so the wine fits the vintage. He makes the best Latour possible with what each vintage gives him while still being true to Latour. Latour is all about black fruit and ripeness with layers and layers of complexity from the fruit and soils and oak. I usually find black fruit, pencil shavings, tobacco, minerals, and subtle but present oak. When very young, the wines can have an almost painful intensity. When developed, Latour is sublime, rich, and endlessly fascinating to drink. Ch. Latour commercializes three wines: the Grand Vin de Ch. Latour, a second wine called Les Forts de Latour, and a third wine labeled Pauillac. Les Forts de Latour and Pavillon Rouge du Ch. Margaux the best of the second wines of Bordeaux. Some Bordeaux aficionados refer to Les Forts as a second wine masquerading as a second growth. That’s actually not far from the truth. Latour’s Pauillac is more the equivalent of most other properties’ second wines. Both offer earlier drinking glimpses of the majesty of Latour at substantially lower prices. Tasting at first growth Ch. Mouton also brings tastes of fifth growth fellow Pauillacs d’Armailhac and Clerc Milon. All three are owned by Philippine Rothschild, daughter of the late Baron Philippe Rothschild. Mouton is usually a great ripe blockbuster of a wine that many tasters say has an almost California style due to its ripeness and its fruit emphasis. I like Mouton best in the great hot years and less well in the more classically typical Bordeaux years. The best Moutons show ripe black berry fruit with lots of cedar and tobacco and even pencil shavings along with dusty gravelly terroir notes and a healthy dose of oak. Some of this style extends to the lesser siblings Clerc Milon and d’Armailhac. I tend to like the less expensive d’Armailhac better as a barrel sample and for the first five or so years after the vintage than its sibling Clerc Milon. After five or so years, Clerc Milon seems to pass d’Armailhac and continue to develop. To me, d’Armailhac has more power and fruit while Clerc has more elegance and balance. 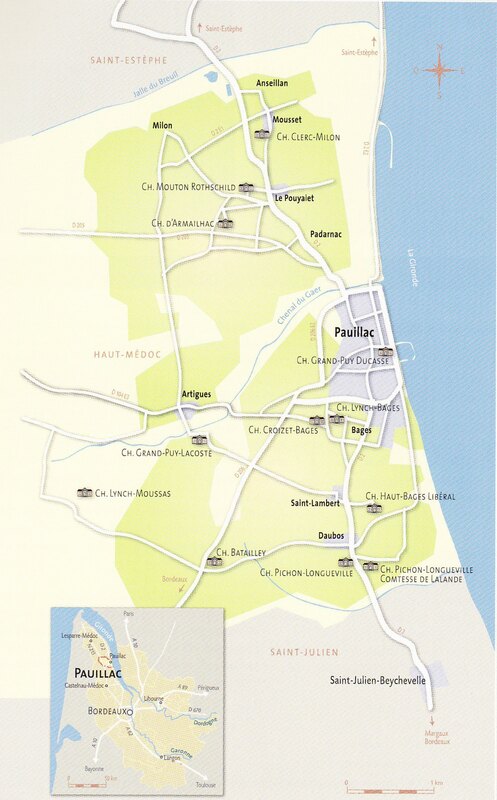 In 1926, a large part of the famous Pauillac second growth Ch. Pichon Longueville was sold. The new property was called Ch. Pichon Longueville Comtesse de Lalande and is now widely known as Pichon Lalande. The unsold portion then became Ch. Pichon Longueville Baron de Longueville and is now widely known as Pichon Baron. The two chateaux face each other across the main road from St. Julien to Pauillac. Although they are formerly one property, the wines are quite different. Pichon lalande is an elegant, somehow feminine wine with an ethereal, perfumed character. It is much easier to evaluate in the second and third years than in the first where it is often overlooked due to its unforthcoming nature. Ch. Pichon Baron went through an underperforming slump until it was purchased by AXA in the 1980s. AXA installed Lynch Bages owner Jean Michel Cazes to manage the property. He quickly got things in order. With its juicy-ripe, straight forward, classically Pauillac style, Pichon Baron has since taken its place among the best of the second growths. It is always interesting to see which of the Pichons made the best wine in a particular vintage. In most vintages, both Pichons offer the complete package. The second wine of Pichon Lalande is Reserve de la Comtesse. The second wine of Pichon Baron is les Tourelles de Longueville. Fifth growth Ch. Batailley used to be a lot bigger encompassing the vineyards of Haut Batailley as well those that are now its own. When the property was split, the existing chateau went with the Batailley name. Ch. Batailley is classic old style Pauillac. It rarely gets great marks when tasted young (it also never gets bad marks) but it is the sort of wine, like Gruaud Larose in St. Julien, that really rewards the time you cellar it with development and improved flavor. When I think of Batailley, I think of black fruit, pencil shavings, and tobacco with a rich but rustic feel. Ch. Batailley just tastes good every time I drink it. Francois Xavier (who lives with his wife and children at Grand Puy Lacoste) is working to further improve the two fifth growth Pauillac chateaux as he focuses in on Grand Puy Lacoste and Haut Batailley. When I think of these two Pauillacs, I think of dark, ripe but still forward fruit and complexity in the pencil shavings and tobacco range with a gravelly-minerally nuance. Grand Puy Lacoste is a bit bigger and richer and a bit more intense due to its better terroir. Ch. Haut Batailley has long been a personal favorite as a Pauillac priced where I can drink it on a fairly regular basis. The second labels of both properties will become more important as more severe selection is made to make the first wines from both chateaux even better. The second label of Ch. Grand Puy Lacoste is Ch. Lacoste Borie. The second wine of Ch. Haut Batailley is Ch. Tour d’Aspic. All four of these wines are well worth seeking out. Spec’s is one of the first to bring Tour d’Aspic to the US.